Ruh roh! Apparently the geese were out celebrating Canada Day a little early! On my way home from art class yesterday I ran into this gaggle of geese (yes, I did have to Google “What is a flock of geese called?”) blocking the sea wall. This is a perfect example of why I love taking classes at Emily Carr on Granville Island. I get to ride my bike along the sea wall & there is always something interesting to make me smile. These particular geese didn’t seem too concerned about us pedestrians. Or cyclists. Or people walking their dogs. They were just hanging out & if you got too close or if certain ones got too close to each other, they started hissing. 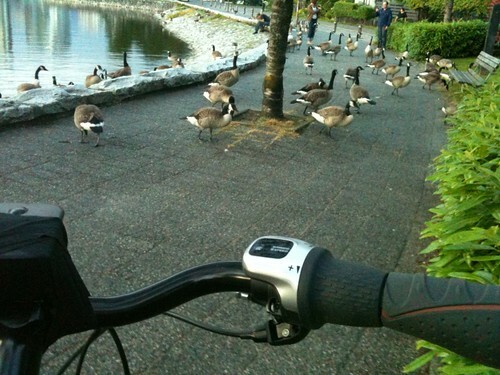 I have a mild fear of birds at the best of times, so being surrounded by geese that seemed none too pleased was quite the achievement for me. If one had actually lunged at me & snapped at my leg? I think I would’ve fainted on the spot! For my non-Canuck friends, July 1st is Canada Day & I am taking a little holiday. My best friend is moving to California in a few weeks, so we’re hopping on the ferry tomorrow morning & heading out to the island for a couple of days. I’m going to miss her terribly, but I’m really glad we’re getting a chance to spend time together before she leaves. I’ve only lived in Vancouver for 3 years & though I’ve been blessed with meeting some really wonderful people, it takes a lot of time to build close friendships. She is definitely one of those good eggs who I feel totally comfortable with, can tell anything & know I could count on when times are rough. Needless to say, I’m sad. Next postPug is loving the island! Purple starfish everwhere! !